The Texas A&M home is made of interchangeable "groWalls," some of which contain all the utilities needed for kitchen, bath, or living rooms. PV panels hang from an external skeleton of cables. Imagine instead of just moving furniture around when you wanted a change, being able to switch rooms around. 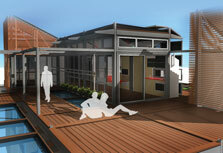 The Texas A&M Decathlon team's vision is for a totally modular "plug-and-play" home. "You could swap the position of the kitchen and the bath without a problem, buy an extra kitchen on eBay, or sell off a couple of rooms after the kids move out," says recent architecture graduate Thomas Gerhardt. The A&M "groHome" concept is based on interchangeable and interconnected "groWall" units, some of which will have all of a home's kitchen, bath, or entertainment utilities built into them. "All the electricity and plumbing is easy to get to, and the plug-and-play approach will give the homeowner great flexibility, but it made things challenging for us," says Environmental Design student Josh Canez. Another distinctive feature of the Texas A&M home is that it is like an animal with two skeletons. An inner skeleton of steel columns and beams provides the basic structure to which a skin of groWall units and structural insulated panels attaches. Then an outer skeleton of cables set 2 ft (0.6 m) to 3 ft (0.9 m) apart from the walls provides support from which the home's PV panels (or other features such as flower trellises) are hung. Just as extra rooms can be easily added, so can extra PV panels to provide power for them. If a hurricane is forecast, the envelope of PV panels can be replaced with "armor." Hot water for both space heating and domestic water comes from a set of vertical evacuated tube solar collectors on the north side of the house. Lighting features paper-thin, bendable CeeLite light-emitting capacitors (as opposed to diodes) that can be cut into any shape. The "healthy home" landscaping includes a reflecting pool—complete with fish—a wetland to treat the pool water, and even a "bat tower" to provide fertilizer and get rid of insects.